Using affirmations for weight loss can help you create and reinforce thinking and behavioral patterns that help take off extra pounds. In other words, to the extent that they can help you modify the behaviors and thinking necessary for you to achieve your goals, they do work. But keep in mind, the key is to modify behavior! Please don't waste your time if your plan is to ONLY use affirmations for weight loss without making any effort to change your eating and exercise habits. In my Thin, Fit Fabulous You Platinum program, I work with you to identify and address ALL the aspects of weight management. That is because there are often much deeper issues at play when dealing with weight loss: Issues like low-self esteem, guilt and emotional eating, profoundly influence your behavior -- even though at times your reactions may be completely unconscious. Aside from emotional and self-image issues, there are many other aspects of behavior that influence weight such as the TYPES of food you eat, TIMES you eat, the AMOUNT of water you drink (and when), hormonal issues, etc. Unless you deal with all the aspects of your particular issue, you can go on a crash diet and take weight off but it is unlikely you will keep it off for good. That is because quite naturally, especially in times of stress, we return to old habits if the underlying cause is not addressed. 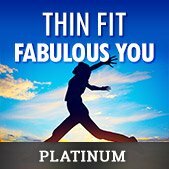 If you ever get to a point where you are ready to take the weight off and MAINTAIN your best weight, shape and size, then consider the platinum version of Thin, Fit, Fabulous You (now on sale). 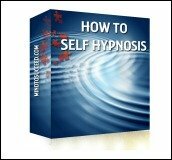 In these affirmations, you will notice that I address more than just eating and exercise. Why? As we head into summer, it is natural to want to look your best in a bathing suit. 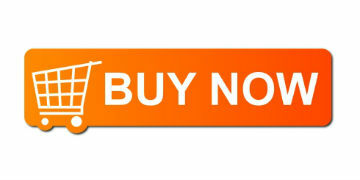 But it is important to recognize the long-term impact excess weight can have on your health. In choosing your goals and affirmations for weight loss, think beyond how you will look in your swim suit this season, focus on creating good, sustainable habits and a healthy weight that will carry you forward and help you FEEL good way into the future. 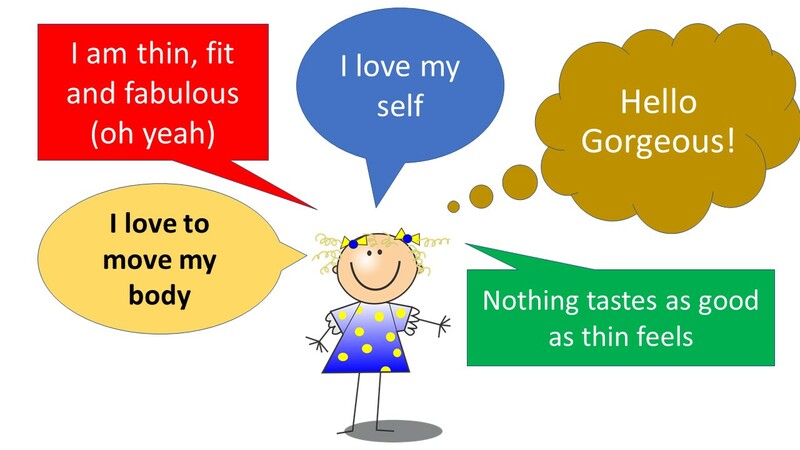 In these affirmations for weight loss, I address various aspects of eating, exercise and self image. Only you know what areas you need help in the most. I suggest you pick three to five affirmations that address YOUR most important weight loss "issues". Make them your own by adding or changing words, but keep the basic sentence structure I use. It is important that affirmations be in positive, present tense language. I am my ideal weight, shape and size. I am looking and feeling my best. Every day and in every way my habits support the best version of me. I am grateful for how I look and how I feel. 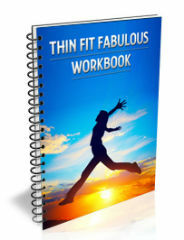 I easily and effortlessly achieve and maintain my ideal weight, shape and size. I eat what I want, and I prefer (x, y and z type foods). The first taste is always the best, after that (food type) goes downhill. I am fit, healthy and fabulous. I love healthy, wholesome foods that are good for me in every way. I am effortlessly making positive, healthy choices for my life and my body. I love to move, exercise and stay in shape. Exercise makes me feel healthy, vital and alive. I respond to emotional upset in healthy ways. Food is fuel. My body is the temple that houses my spirit. I treat it with care and respect fueling myself with foods that are clean, nutritious and wholesome. I look for ways to be active, fit and healthy. I am easily maintaining my weight of _____ and size _____. My clothes look and feel good on me. Beauty radiates from within me. How I look is just icing on the cake.